Spring is definitely in the air! And you know what that means? Many opportunities to stay active for free! 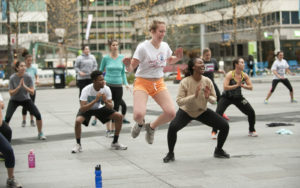 Beginning in April, the popular spring training classes, hosted by Dilworth Park, will run for eight weeks. Classes include yoga, bootcamp workouts, zumba and group runs- no registration required. Just come ready to move! The spring training classes will begin on Tuesday, April 3rd and will end on Thursday, May 24th. For exact dates for each class, check out our Philly Powered calendar or click here for the Dilworth Park’s full schedule on their website.